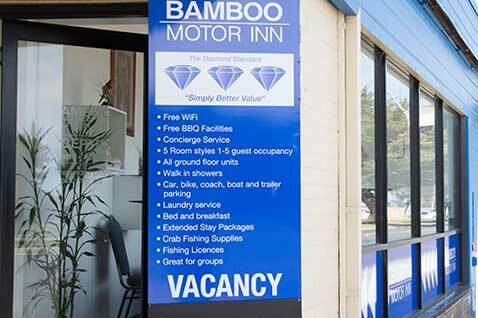 Bamboo Motor Inn is one of the most convenient places for an overnight stay in Lakes Entrance. We provide good value, clean, comfortable and affordable accommodation for individuals, corporate guests, couples, families and groups. We have 16 rooms, all are ground floor with walk in showers and an adjacent parking spot. We can provide rooms with limited wheelchair access, provided requirements are discussed prior to booking. Boat, trailer and bus parking are available on request, please arrange with reception. Free BBQ facilities are provided on-site for you to cook your catch, or to enjoy lunch and dinner outdoors. During your stay here with us, there are plenty of places to visit. 30m to the Lake, 200m to the V/line bus stop, 400m to Safeway, Cafes and Restaurants, Hire boats, fishing, cruises within 200m. The Bamboo Motor Inn welcomes bookings from community groups and businesses. Holiday tour groups can stay either overnight or grab a package deal. The Bamboo Motor Inn takes guest bookings on the following: Local restaurants ,Takeaway Chinese food, pizza and pasta, The Peels Cruises – Metung Lunch Cruise, Recreational deep sea and lake fishing charter, fishing licences, the Shell Museum, and Buchan Caves. Shared usage of barbeque cooking facilities outdoors for all kinds of food, in particular highly spiced food and seafood. We can provide all the required utensils and consumables required. Shared freezer usage is available for storing seafood and bait. Please check with Reception regarding the availability of the freezer prior to making your booking. An external power supply is available upon request and should be booked when making your reservation. Room Service:- Continental breakfasts and Cooked breakfasts and Nespresso pod and plunger coffee are prepared immediately before service and available from 7am – 9am each morning. One free car parking space is allocated close to each room. Should you require additional parking spots then please book space for these in advance when making your accommodation booking. We have rear access for high vehicles and long spaces for coach, boat and trailer parking. Our range of rooms covers the needs and requirements of a variety of guests from our Standard Room with basic facilities to Suites and Superior styles with advanced features. Facilities in the standard rooms may be upgraded by the provision of items such as – Folding beds, cots, microwaves, DVD players, electric blankets, steam irons at an extra charge of $15 each. We offer the fastest broadband available in Lakes Entrance. The ‘Free Internet Access’ included in the room tariff unless otherwise stated is 24hours/300mb combined access for two devices. Additional access is available at a small charge. Animals are not permitted on the motel premises either in the car, outside the room or in the room due to health and safety regulations, consideration for other guests and the welfare of the animal. However, there are local catteries and kennels catering to visitors. Please ask Reception for a list of reputable businesses in the area if you would like to bring your animal. The Bamboo Motor Inn endeavours to maintain a peaceful environment for all guests utilising our affordable motel facilities. For this reason we manage this motel to achieve the optimum mix of enjoyment and consideration for needs and expectations of our guests. As owner managers we live on the premises and are available to guests 24/7. Just click here to visit our Book Now page.